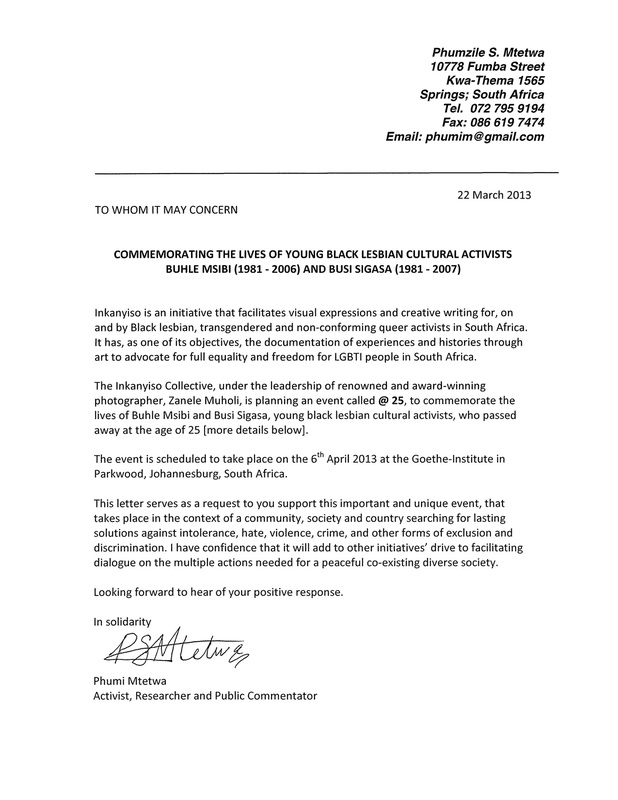 On 21st March 2013, Inkanyiso sent out invitation letters and call for help to different organisations to host @25 event to commemoration the lives of Busi Sigasa & Buhle Msibi. Some responded to the call by sending letters of support. Others pretended to be confused by the request for letters of support. High profiled organizations who are serving the same LGBT organizations never responded at all assuming that giving support meant financial help. The cost for the whole event came to R22 000- to cover for material used, transport for community members who came from various townships, petrol for the week’s trips; food and communication. Zanele Muholi paid for the expenses with the credit card since Inkanyiso has no donor funding and all the crew volunteers their skills and time to sustain the initiative. We are still grateful to Khanyile Solutions (free staff t-shirts); Goethe Institute for the venue and all the Inkanyiso staff. Not forgetting our Mcee s Donna Smith, Phumla Masuku and Nokuthula Dhladla who blessed us with the prayer. To the LGBT representatives, poets, speakers for that day sithi Makwande. We’d like to express our gratitude for all that you did or continue to do for us. Image | This entry was posted in Black Lesbians & Allies Against Hate Crimes, Collaborations, Contributors, Crea(c)tive senses, Creating awareness, Education, Evidence, Exposure, Expression, Family, Friendships, Hate Crimes, Homosexuality, Human rights, Inkanyiso crew, Intellectualism, Johannesburg, Know Your SA Queer History, Lack of Resources, Queer visibility, South Africa, Visual history is a Right not a luxury, We Care, Writing is a Right, Youth voices and tagged Activism; Letters of support; Phumi Mtetwa; James Green; Allies; Activists; Letters are more than support; Communities;, Commemoration, Credit card, James Green, March, With/out funding we still can. Bookmark the permalink.